RIYADH, Saudi Arabia, Jan. 29, 2019 /PRNewswire/ — Automaker GAC Motor has opened a new sales and service center (“the Center”) in the heart of the automobile business district in Riyadh, the capital city of Saudi Arabia. The 5,588 m2 (60,148 ft2) Center, located on Makkah Al Mukarramah Branch Rd, Riyadh 12813, is the largest GAC Motor store among the four existing centers in the country and is operated by Aljomaih Automotive Company (AAC), the automaker’s exclusive dealer in Saudi Arabia. The three other sales and service centers in Saudi Arabia are located in Jeddah and Dammam. The opening ceremony featured the launch of GS7 SUV and GM8 minivan, and the vehicle delivery to major client, which was witnessed by over 100 VIP guests and media including Mr. Li Bei, Office Director of Embassy of the People’s Republic of China in the Kingdom of Saudi Arabia, Mr. Chen Hanjun, Vice President of GAC Group, Mr. Yu Jun, President of GAC Motor, Mr. Wang Shunsheng, Vice President of GAC Motor International Sales Company and Mr. Sheikh Waleed, COO of AAC. 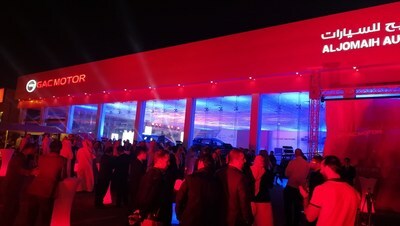 “The opening of Riyadh Sales and Service Center today and the launch of new vehicles shall be another milestone indicating GAC Motor ‘s retail channel arrangements in the three major cities of Saudi Arabia in full operation. And we are committed to providing Saudi Arabian customers with an enjoyable mobile experience,” said Yu Jun, President of GAC Motor. GAC Motor’s partnership with AAC is of strategic significance in the Middle East. AAC has more than 50 years of sales and service experience and is the largest GM dealer in the region. GAC Motor signed a partnership agreement with AAC in 2018 to invest and build four sales and service centers, with the goal of making GAC Motor a mainstream automotive brand in Saudi Arabia in the next three to five years. 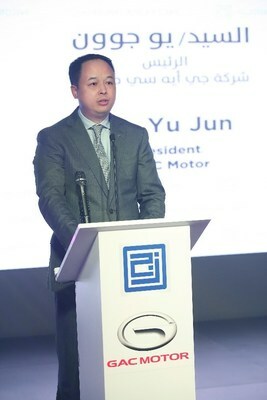 Sheikh Waleed, COO of AAC, noted, “We have set a great goal and challenge to satisfy our customers in the Kingdom by providing services that are in line with the name and luxury of GAC cars,” and he said he is confident that the quality of GAC Motor’s products will exceed the expectation of the consumers in the Saudi market. “Automotive products are a means for people to connect during life’s great journey. Our robust growth in Saudi Arabia helps to strengthen positive relations between our two countries. With our high-quality products and services, we are a friendly example of the thriving exchange between China and Saudi Arabia.” Yu said. GAC Motor now operates in 16 countries and has established a global research and development network in five cities around the world. The company is partnered with 18 of the world’s top suppliers and has encouraged further communication and understandings among the different regions through its integrated business development strategy. GAC Motor positioned the Middle East region as an important part of its overseas strategy and a major supporting factor in the company’s drive to build a leading global auto brand. In the near future, GAC Motor plans further developments in the Middle East and will accelerate its globalization plans. Founded in 2008, Guangzhou Automobile Group Motor CO., LTD (GAC Motor) is a subsidiary of GAC Group which ranks 202nd among Fortune Global 500 companies. The company develops and manufactures premium quality vehicles, engines, components and auto accessories. GAC Motor has now ranked first among all Chinese brands for six consecutive years in J.D. Power Asia Pacific’s China Initial Quality StudySM (IQS), demonstrating the company’s quality-centric strategy from innovative research & development (R&D) and manufacturing to supply chain and sales & services.